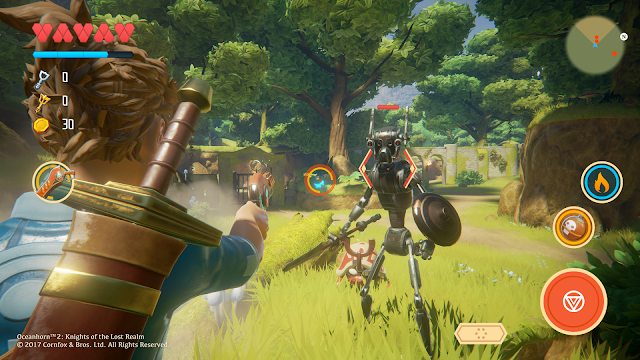 The reveal of Oceanhorn 2's development got an amazing reception from all of you back in August. Thank you so much! It has been five months now and we have been very busy working on the game, to fulfill our dream project one asset and feature at a time. Unfortunately, we haven't had time to give you guys any updates. Let's remedy that right here, right now! Over the years, we have learned that making a video game is a huge undertaking. For Oceanhorn 1 we did everything from ground up, from using a proprietary game engine, designing and developing our own full featured level editor to a highly laborious porting and upgrading work that had to be done for other platforms. 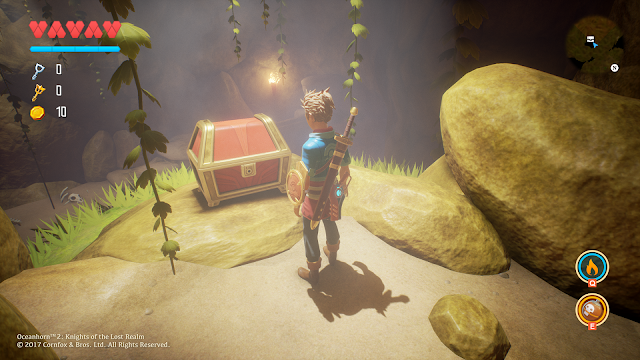 When we were dreaming up what Oceanhorn 2 should be like, we knew that we would have to do everything from ground up yet again if we would continue using our own tools. 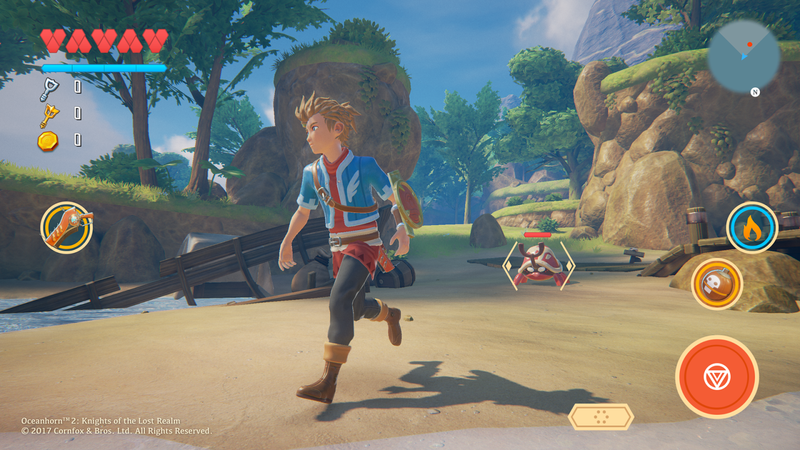 To meet the high expectations of the video game audience on mobile, high-end PCs and consoles, we decided to start developing Oceanhorn 2 on Unreal Engine 4. Unreal Engine is a game engine that has proven itself in hundreds of big titles over the past 20 years. Its graphical capabilities and level editing tools are the best the industry has to offer. We have the artistic freedom, and to ensure we can achieve what we set out to do, Epic allows us developers to access the engine source code. With Unreal Engine 4, we basically have hundreds of man years of video game development backing us up, and delivering our uncompromised dream is still going to be in our own hands in the end! "With Unreal Engine 4, we have hundreds of man years of video game development backing us up"
This project has introduced a lot of new and exciting things for us, from new ways of thinking to new tools and workflows. As an artist, I had to learn everything about physically based rendering. It provides an intuitive way to express the realistic properties of the materials for the renderer. It is a relatively new way to get realistic looking materials for a modern game engine that handles realistic lighting. Our game has an artistically stylized look, but even our style benefits from the physically based rendering. Pixar animations have used it for years, but these days we can render it in realtime, even on mobile. When setting up the renderer and materials, we wanted to make sure everything will work on both PC and mobile. Minor differences can be seen in some of the screen space effects, as all of them are not yet feasible on mobile hardware. We started optimizing the project for the mobile right from the beginning, and when we started to test out our game on actual mobile hardware, our efforts paid off. In our previous announcement blog post we shed light on some of the new gameplay aspects featured in Oceanhorn 2. These were just a few examples of the features that will make Oceanhorn 2 truly special. We will be sharing more exciting news with you in the upcoming months. There is a certain unrevealed element in the game that makes Oceanhorn 2 different when compared to other games in the same genre. 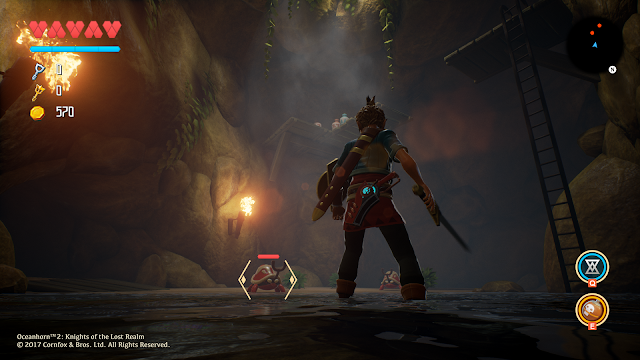 We have been experimenting with this element right from the beginning, and we are starting to see the impact it has on Oceanhorn 2. When developing new and exciting elements to the game, our main goal is always to improve the player’s experience and reinforce his or her emotional investment to the the world and story. We also aim to enrich the aspects that people loved in the original game, such as exploration. In many ways, experimenting with features is one of the perks of being an indie company. If we come up with the best thing ever for an action RPG at any given time, we can go ahead and add it to the game. In our day to day development, we have reached a point where we can produce game content fast. More cutscenes and levels are being added to the game every week and the quests are starting to shape up. Still, we have a long road ahead of us to finish this game and I hope Oceanhorn fans can wait patiently. 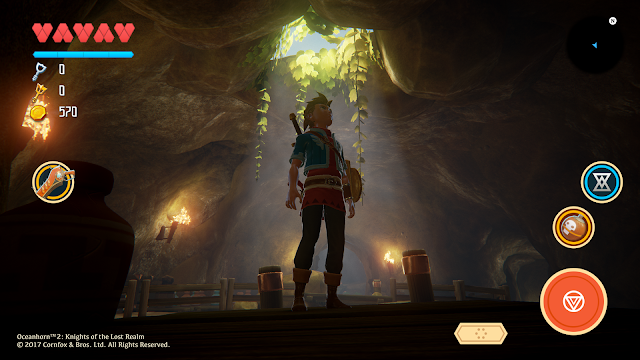 We have received lots of questions about the platforms which Oceanhorn 2 will be released on. We can’t confirm all of the platforms yet. What we can say is that Oceanhorn: Monster of Uncharted Seas sold over 1 million copies on all platforms combined, but let’s remember it started out as an amazing iOS adventure game. Oceanhorn 2 will definitely come out on iOS. Man I was already excited Oceanhorn 2, but now I am just bursting off the walls with joy! I hope the game development goes smoothly and, even if it takes awhile till its release, I hope that it becomes a hit. One question I do have though that I didn't ask the first time, how will travel work in this game? I know in the original game we traveled by boat on the ocean and there was a designated spot where we started on each island, but how will it work in this game? I assume based on the world map from the original sequel announcement that we will be exploring one large island (or technically a chain islands that make up a large circle outline) but how will we traverse the large island? Will there be some sort of barrier preventing us from going to certain locations earlier, or will it be kind of open world and we can do whatever we want in any order? But a bigger question would be this, is the entire island explorable, or just the area around each dots? Do I unlock an area by hearing its name and then a dot appears on the map which I can travel to by clicking it? Or do I actually get to journey out to that spot myself? Its fine if there's a path laid out that I have to follow but the game wouldn't feel as adventurous if I just used a system of warping to get from place to place. So lets say I'm at.... West Station and I want to travel to... Submeria (at least I think that's what their names are) do I actually get to travel to the middle of the ocean and descend down to Submeria or is it just a magical teleporter that takes me there? I mean I am so excited for this game that, no matter what, I'll end up buying it when it comes out. I was just a little curious how the large scale traveling worked. Either way, you guys are doing a great job, keep it up!!! Also, (sorry for multiple comments) I hope that, even if the Caster has a long list of spells to select from, we still have a wide range of inventory items to choose. I know that at this stage of development that my opinion doesn't mean much, but I just hope that both spells and inventory are important. Like how in Majora's Mask we had our basic inventory and then a second inventory for masks, but if you compare your regular inventory to some of the other big Zelda games like Twilight Princess or Ocarina of Time you'll notice that only have a handful of different types of items (bows, bombs, clawshot, eye of truth, and a few miscellaneous items for specific situations). Well don't get me wrong because Majora's Mask was a great game, but my point is that the actual inventory of the game, a big part of each Zelda game, wasn't as exciting and didn't have as wide range of usage as other inventory sets. I hope you show us some creative new items that maybe even the boys at Nintendo haven't thought of. But best of luck to you! Hi Jebradiah Drake! You have cracked the alphabet! ^_^ - yes, those are real locations in the world. We will have a world map that you can explore and travel from location to location. You will travel by land on foot and with vehicle(s). It works like a hub between locations, that are similar in size as Oceanhorn 1's islands. All the locations are not marked on that map we released earlier. We will write more about it later in our blog. Thank you for waiting patiently! Awesome!!! I hope we learn more about Faroah's past when we revisit it! I think the Wicked Boy was Mesmeroth but honestly I am not sure! Well I mean that might make sense for Everturso since we never learned how it was destroyed, but Sealork was destroyed by the Owru warrior Throne and the main character clearly isn't an Owru. Also there is one spot on the map, under the area of Arcadia, that reads "New Capital". I think that means this is the reborn Arcadian Empire after the hero from the last game lifted the curse of Mesmeroth and Oceanhorn from the land. But interesting idea. We can't be sure until the game releases or Cornfox gives us some more insight on the story itself. We here at 2 Player Co-Op absolutely LOVED Oceanhorn after finally getting to play it on PS4 this year. It was Kevin's 2nd favorite game of the year, and was Sean's #3. Needless to say, we cannot wait to hear more about the sequel, and we are HOPING to see that announcement that it will be on PS4 from the first release date! :) Kevin also can't wait to play through Oceanhorn again as soon as it hits Vita. Thanks for all you do, and we cannot wait to hear more! Dang, guys. This looks so awesome. Thank you for the update! You guys are awesome. Hi guys when I seen the first pics on TA from the new Oceanhorn NoTLR I am so excited,the over the shoulder view is such a good choice it takes the player "in" the action instead of looking "to" the action when all the new gameplay and graphics elements come together this must become a fantastic new Oceanhorn game p.s is it months or years away because waiting for some that's looking so great and fantastic is very hard.Thanks guys and keep up the fantastic jobs you guys are doing!! Will you have simultaneous Android and IOS launch or will they do the same as the first title release after 10 years for Android platform? Please , launch for Android too . I am excited for this game. I would love to beta test this for iOS! Hi David John. We are a small developer, so it is impossible for us to release all versions of the game at the same time. With Oceanhorn 1, we worked hard together with our publisher FDG Entertainment and porting partner Engine Software to get our game out there to as many people as possible. I know three years is a long time, but we I am happy that you got to play it in the end. Hey ummm is this going to realese on Android? And if it does it will be at the same time as iOS or it ill come months later? Hey! this looks AMAZING! any plans for a Nintendo Switch realese? as the first one ia comming to it?? I just finished playing this game on Xbox One and it was really fun! This sequel looks like a huge leap forward, and I'm excited to play it! Will this come out for Consoles also? And will it get a retail physical release maybe 505 games can help you guys with a retail physical release you can contact them Stardew Valley is getting a retail physical release from them and that's a indie hopefully the first Ocean Horn can get a retail physical release also from 505 games! Please from reply if you see this. Hi Thunder Light! We will see about physical release as we start to look for potential console publishers for the game. Let's see who is interested! ^_^ - thanks for rooting for us! I think 505 games would be interested to do it I asked them! Please release the first Oceanhorn on Retail first ask 505 games I'm sure they would do it! An update yet? Like I said 505 games is interested! I found Oceanhorn by searching "Zelda Like Games PC",and i'm very happy about this game....Cant wait to play Oceanhorn 2...Any release date??? Is it going to be released on iOS? When is it going to be released? Hey Cornfox, I was reading earlier today about how the upcoming Zelda game, Breath of the Wild, will have bonus DLC you can buy for it to expand the game. Now it seems like the game itself is complete and the DLC is completely bonus content, so it's not like you have to buy it to play the finished game. But it seems a lot of people have mixed feelings on it, some think it's great and other feel like they should update the game for free. So I just wanted to ask, if you guys ever read this comment, how do you feel about it? I wanted to ask you guys because you all spent so much time updating the original Oceanhorn game for years and years without asking for anything more from your fans. It would really be nice if I could hear your honest opinion about it. If you do like the idea of the new Zelda game's DLC would you ever like to do something similar with your new Oceanhorn game? Something similar to the original Island of Whispers update except simply asking for a small amount of money to unlock the bonus content. Or will you guys always update your game for free? If you do not want to upset your fans on either side of this debate I understand if you do not want to answer this question. But I'll support any decision you make for the series. Will it come out on android? I want Oceanhorn 2 on my Apple TV please ! Thanks. I have an ipad 4 with iOS 6. Can I buy Oceanhorn and download the latest version compatible with my device? Do you guys have an idea about a release date? I'm a high school senior and my school uses iPads in the classroom. My friend and I were absolutely obsessed with Oceanhorn 1 and played the heck out of it during class! We were wondering if, though probably unlikely, we would be able to have a chance to play the sequel of our favorite game before our senior year ends and we have to move onto college. Thanks! i cant wait till part to comes out it looks awesome i purchased the first ocean horn for my ps4 i couldnt stop playing. I really like your blog .. I see your blog daily, it is very useful for me. You can also see my services .. Working With Android proporciona todo lo relacionado con lo Noticias para android y windows. Tutoriales bien explicados para obtener soluciones a problemas comunes. man this should come to switch too, as much as i love iOS but i think right now switch is taking over the gaming on the go. Hey Cornfox, do you guys have a release date for the ios version of Oceanhorn 2 yet? I'm dying to know!!! I really looking forward to this graphically masterpiece almost everything from the previous game is enhanced and the best enhancement is in my view "the over the shoulder view"I hope that they made a little more structure in the levels I know that it is an exploration,action,adventure but I am stuck in the first game where to go next and I trying multiple times to finish the game but I don't find a clue where to go next mabey this has to do that between play sessions there could be some weeks so at such a point there isn't any help where you are in the overall story I played all the islands again and talk with a lot off islanders but I don't get any clues were to go next so there comes a point that time after time I am only backtracking with any progress in the storyline and I playing games from the beginning of the SNES so I am use to verry hard and difficult games but I can't crack this one so but I am sure that I overlook a clue but I don't find it so I hope that it becomes a little bit more clear without given to much away where to look next but this is the only criticism that I have about the first game but I understand that it must be very difficult as a developer to find a way that people don't get lost and steer them in the right direction without spoiling the exploration element to much I wish you guys all the best and I am looking forward for your next fantastic Oceanhorn adventure this must be such a leap forward in the way people experience the adventure. pls when is relase date?do u have discord channel?